Devils new signing Drew Schiestel. Pic: Richard Murray. 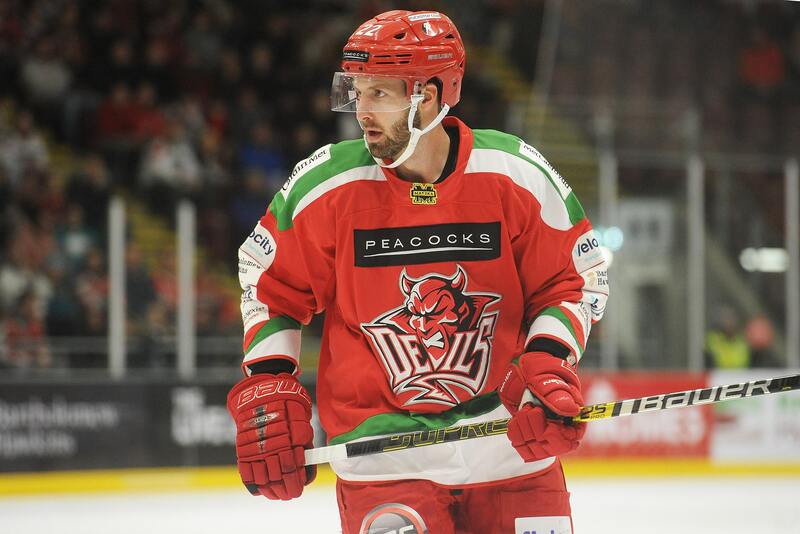 Drew Schiestel looks certain to be back in action for Cardiff Devils when they play Guildford Flames at the Viola Arena in Cardiff Bay on Wednesday evening. Pace ace Schiestel – his name rhymes with pistol – missed Devils two matches last weekend with a minor injury, but is ready to return to the ice. The former Rochester American and Hamilton Bulldogs player is going to be ‘one heck of a D-man for Devils’ says head coach Andrew Lord. Schiestel has pace, experience and an attacking instinct which makes him an outstanding signing for a Devils team aiming to win their third successive Elite League title. It has been a difficult season for Devils so far with Tom Parisi, Ben Blood and Justin Faryna leaving the club, but they go into Wednesday’s clash with Flames able to ice a full complement of import players. Schiestel returns, probably alongside Bryce Reddick, and Craig Moore will return to the forwards. Mark Richardson, too, is close to a return and Devils, still right in the title hunt, are aiming to step up their challenge. Schiestel has never won an ice hockey championship, but he says: “I am excited to be in Wales. “My best season probably came in Germany when we lost in the play-off semi-finals against the champions from the year before, but I have not been able to reach that championship level. Schiestel, from Hamilton, Canada, is a fast-skating, D-man who fits perfectly into the way Lord wants his team to play. “Drew is a great skating, two-way defenceman who is solid in his own end and moves the puck well,” says Lord. “His game fits well into our system here because he is mobile and has a great first pass that is perfect with our transition game. Schiestel comes to Wales after spending the majority of last season in Norway with Lorenskog HC before moving to Zagreb in the top Austrian League, EBEL. Drew Schiestel pictured after arriving at the Viola Arena. He spent five seasons in the American League where he played in the AHL All-Star game during 2010-11 season. The following year he played for the Texas Stars alongside current Devil Mike Hedden. Hamilton-born Shiestel, aged 29 and 6ft 2ins tall, is a D-man who can jump up into the play. He has good stick detail, using his reach to stop opposition forwards. “I heard amazing things about the Devils organisation and since I arrived they have done everything ;possible to make me feel comfortable,” says Schiestel. “It’s been fantastic. “Devils have a ton of good players and I have heard over several years that Elite League hockey is getting better and better. Hopefully, I won’t take too long to get up to full speed and progress my game to where I want it to be.